It’s been a few weeks since I last wrote a review, so let’s get back into it. This is a set I picked up while on holiday in Tasmania. It looked like a pretty great firetruck, and although I don’t have an airport (yet! 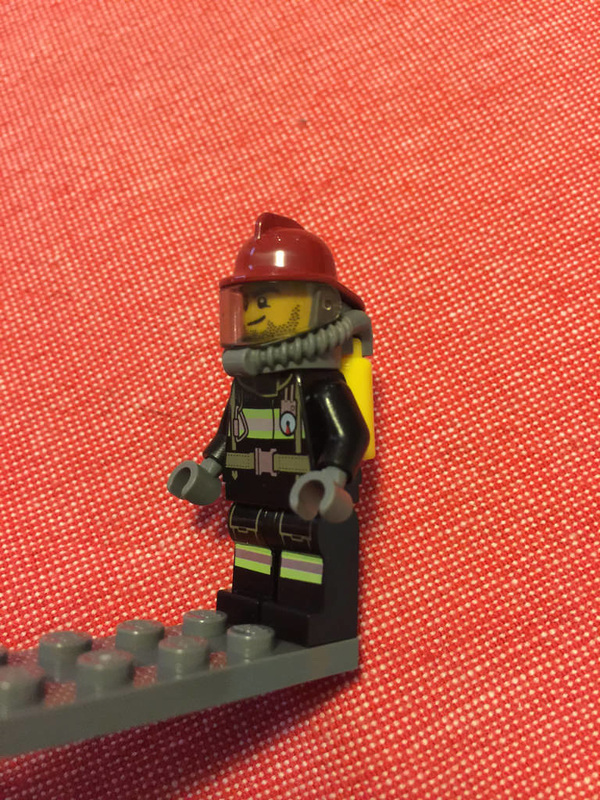 ), I was really looking forward to getting some firemen, so this seemed like a good place to start. 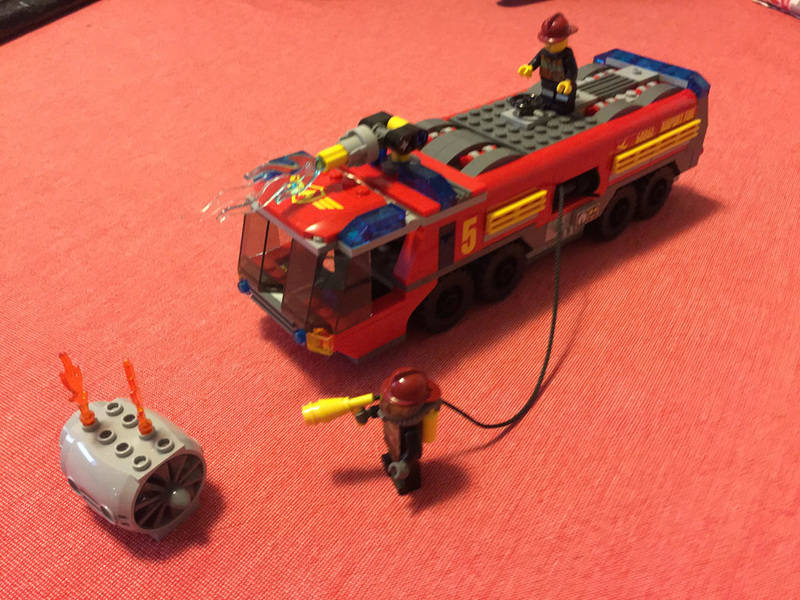 LEGO has had a fair few fire trucks over the years, with the first one being released in 1968. This one looks like one of the biggest of the range. Out of the box you will find three parts bags, two instruction booklets, two loose fire hoses (strings really), and a sticker sheet with 12 stickers. Unfortunately this set doesn’t bring anything new to the table right now, but it did when it first came out, and still does bring some good parts to have. For instance, you get a nice flame in transparent blue and clear, seen at the end of the main water cannon. This was a new part in 2014, and has now been seen again in 76026: Gorilla Grodd Goes Bananas. 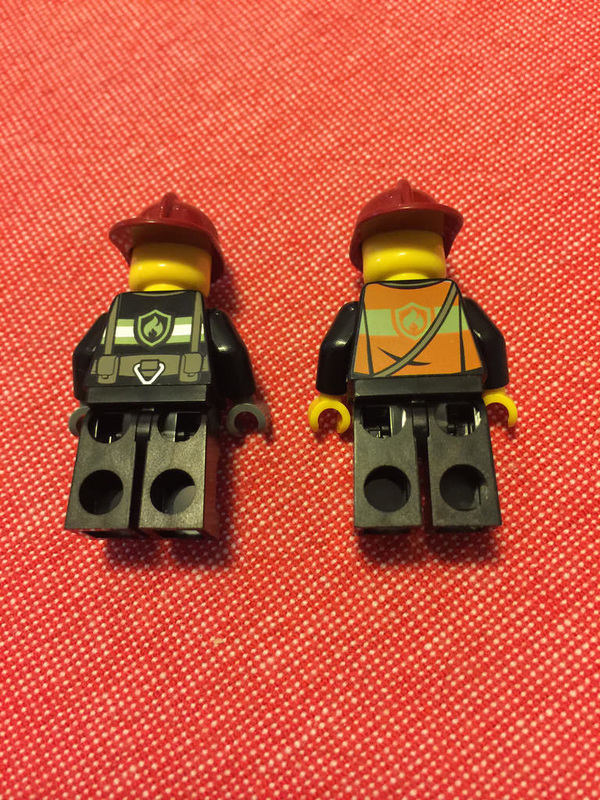 There is also a 1×1 plate in yellow with hollow stud, which are very popular in firefighter sets, as they work really well as the end of a fire hose nozzle. 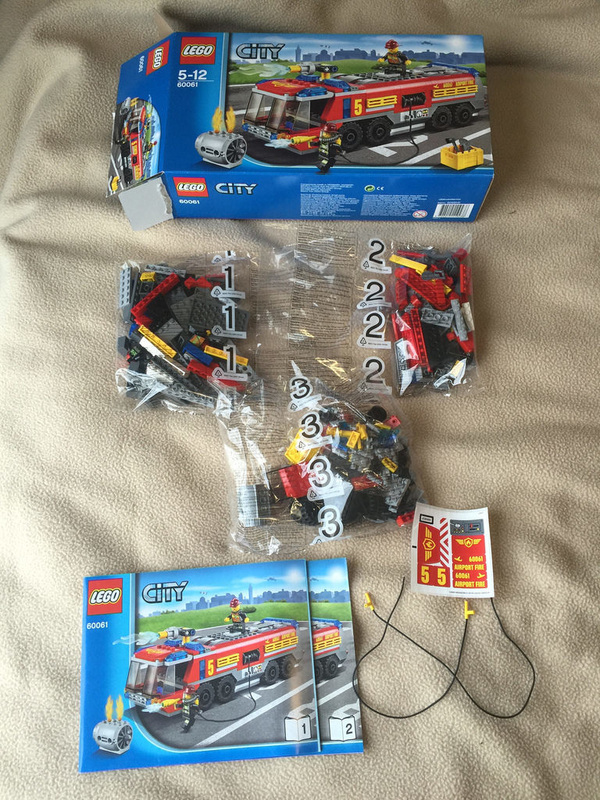 Aside from those, there is the jet engine, a nice 3×4 crate in yellow, two very nice windscreens, and plenty of other goodies we find in many sets. 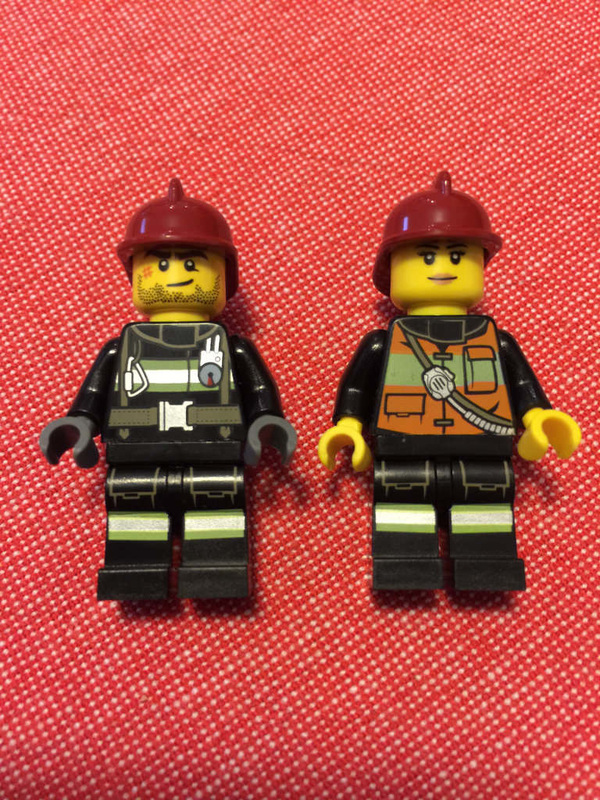 As for the minifigures, there’s two of them – a male and female. Both have nice front and back torso prints, with leg prints as well, but I particularly like the look of the male one. He appears to be wearing a rescue harness, and the breathing apparatus he wears with the air cylinders on his back look great too. This alone was one of the reasons I bought this set! 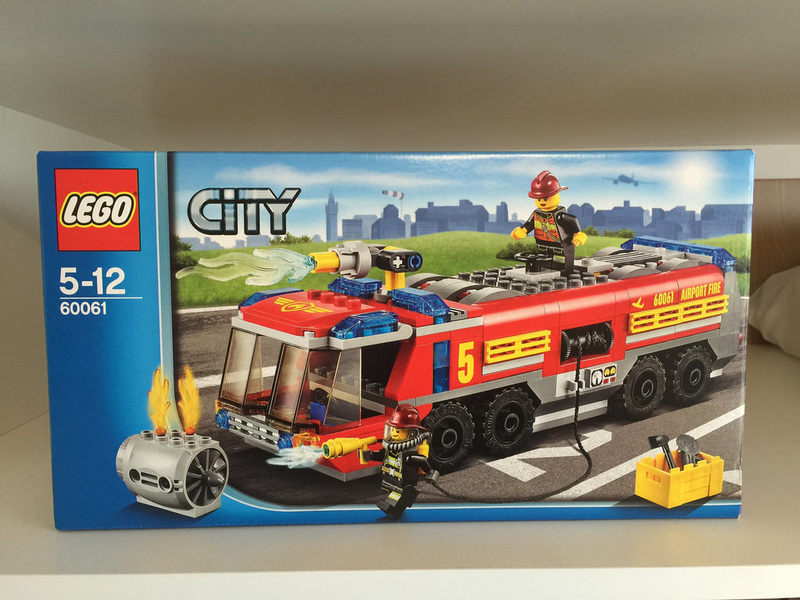 Nothing really special with the spares in this set, apart from the extra fire “hose”. It’s pretty handy to have, especially if you have a spare reel. This build is not overly difficult. There aren’t any real specialised elements. 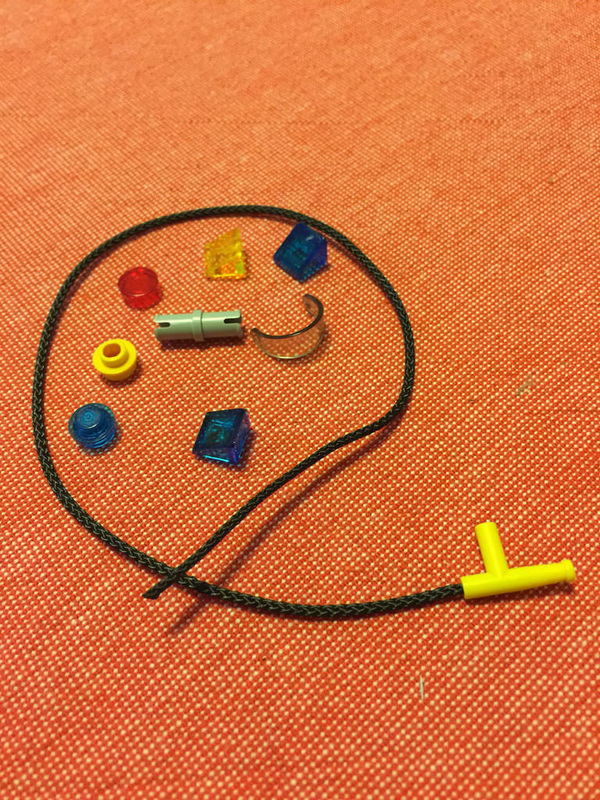 The only tricky part for kids may be the sticker application, and the the threading of the house string onto the reel. The engine itself looks great. It’s a really good size, and I didn’t realise until building it, but it has some good storage compartments in the back, which are accessible from both sides. It is bright, looks a little imposing, and would really suit an airport scene, as it looks very much like ones I’ve seen at the airport myself. The big water cannon at the top is a great addition too, and I particularly like the hose at the side of the engine. It allows for some great playability. The driver’s compartment is nice and big, and has room for two minifigures, which doesn’t often happen in City vehicles. Time for a rating! This set gets 9 out of 10 fire hoses. I’d liked to have seen a small ladder in the set as well, but to be honest, I don’t know if airport fire trucks are equipped with them! The next review will be my second modular, 10218: Pet Shop! The last time I wrote one for a modular, it ended up being very large, so it might be another two post edition. Remember, if you have any comments about this review you’d like to share, go for it! Also, give us a like on Facebook.